caressing the edges of the world. holding back the impending storm. at the Duke’s grand ball. wafting off into the sun. reaches over and pats my hand. to state it out loud to someone else. with a special place in Heaven. I went ballroom dancing last night with my wife. We’re learning the samba now at the studio, one, one-two, one, one, one-two, one, learning how to twirl and twist and do the Cuban walk. But it’s hard for me to concentrate on positioning my feet and holding my frame just right and tilting my head when all I want to do is watch her move, watch her count and stare down at our feet, her brow knitted slightly, her breath coming in little bursts so sweetly, watch the movement of her waist and thighs and hips to the left and the right, forward and back, forward and back. She is a beautiful woman after all and I still have some remnant of maleness so I’ve never lost my fascination for her. Copyright 2008, Michael Estabrook. © This work is protected under the U.S. copyright laws. It may not be reproduced, reprinted, reused, or altered without the expressed written permission of the author. 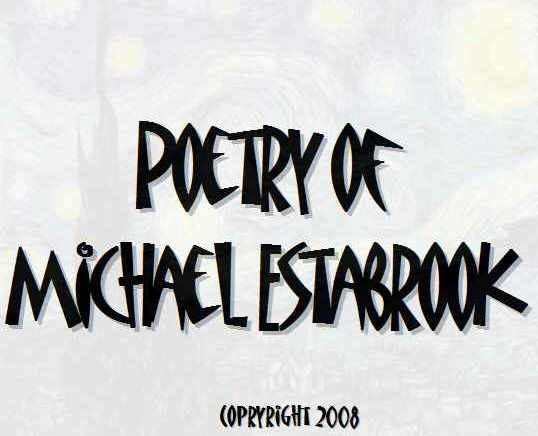 Over the years Michael Estabrook has published a few chapbooks and appeared in some terrific poetry magazines, but you are only as good as your next poem and like a surfer looking for that perfect wave, He's a poet prowling for that perfect poem. Right now he's looking for that perfect poem in his wife, who just happens to be the most beautiful woman he has ever known. If he finds the perfect poem anywhere, he believes he’ll find it in her.